The Mikron MILL P 500 U Milling Machine is offered with 36 kW Step-Tec Spindle, rotary tilting table capacity of up to 600 kg and workpiece diameters up to 707 mm. The unit comes with tilting table in variations such as T-slot tables and pallet tables that can accommodate a payload of 200 kg, 400 kg or 600 kg. It comes with wireless vibration sensing application that uses 5G technology to communicate between sensors and machines. The machine allows continuous machining of complex forms and tough materials with reduces process time. LINCOLNSHIRE, IL, September 4, 2018 – GF Machining Solutions’ Mikron MILL P 500 U high-performance milling solution will make its North American debut at IMTS 2018 from September 10-15, in Chicago, Illinois. With its powerful and dynamic material removal capabilities and high stiffness, this solution takes precision and surface finish to a new level. The Mikron MILL P 500 U enables continuous machining of complex forms and tough materials while shortening process time. Its advanced thermal stability ensures reliable precision over long machining periods. 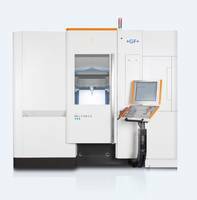 Furthermore, it delivers exceptional competitiveness by integrating smart automation and ensures the process reliability essential to precision parts manufacturing segments such as aerospace and machinery parts as well as automotive mold making. At IMTS 2018, the Mikron MILL P 500 U will make its debut cutting an aerospace impeller and introduce a new, wireless vibration sensing application to reduce errors. Especially important for industries requiring the highest precision, such as aerospace, this new solution uses 5G technology to communicate between sensors and machines to adjust the speed and motion of the milling head to minimize vibrations and maximize throughput. With the Mikron MILL P 500 U, manufacturers of precision parts and molds experience top accuracy and uncompromising process reliability, thanks to the machine’s thermostability and symmetrical design. Even when machining at a fast pace and over long production periods, accuracy and process reliability remain steadfast, so users experience consistent precision. Thanks to the Mikron MILL P 500 U’s 1.7 g acceleration, 36 kW Step-Tec Spindle, rotary tilting table capacity of up to 600 kg and workpiece diameters up to 707 mm, manufacturers experience constant dynamic machining as well as 100 percent flexibility in their part production. The rotary tilting table is available in several variations: T-slot tables accommodating a payload of 200 kg, 400 kg or 600 kg, as well as pallet tables accommodating a payload of 200 kg, 400 kg or 600 kg. Incremental, direct angle measuring systems are mounted on the swiveling and circular axes to guarantee very high positioning and repeat accuracy. Both axes are driven via water-cooled torque motors: one for T-slot tables, two for pallet tables on the A-axis and one on the C-axis. These direct drives bear optimal characteristics for precise, simultaneous operations. For heavy-duty machining, the rotary and swivel axes can be clamped and—for best machining stability—the swiveling axis has clamping on both side supports. With the 20,000 rpm Step-Tec HPC190 Spindle with HSK-A63 tool interface, manufacturers extend their flexibility and benefit from the best universal spindle selection for stiffness, power, speed, and safety with Machine and Spindle Protection (MSP). Also available is Step-Tec’s 36,000 rpm HVC150 motor spindle with HSK-E50 tool interface; this spindle solution is particularly advantageous for mold makers working with small cutting tools and dynamic 1.7 g acceleration to efficiently achieve best surface finishes. At the same time, precision parts producers and mold makers can more than double productivity with the 11-square-meter Mikron MILL P 500 U’s accommodation of limitless integrable automation solutions through the back. That means users can achieve reliable, efficient unmanned third-shift productivity due to an array of automation choices as well as direct System 3R robot loading of pallets to the table and the availability of parts handling solutions. For example, manufacturers’ productivity and agility are increased with System 3R’s JobToolManagement (JTM) user-friendly software for one machine with an integrated pallet changer. With JTM, the user assigns numerical control (NC) programs to pallet positions by dragging and dropping on a touch screen. Mikron MILL P 500 U users slash their downtime from hours to mere minutes, thanks to GF Machining Solutions’ Industry 4.0 supporting smart modules such as Machine Spindle Protection (MSP) and Customer Services’ rConnect modular digital services including Live Remote Assistance (LRA). MSP protects the spindle and machine geometry while maximizing machine uptime to reduce costs associated with unexpected spindle collisions. Collisions usually occur when a new CNC program is first executed. MSP protects the machine and spindle during job setup by making it possible to absorb axial and lateral collisions and then restore perfect accuracy. The spindle can return to normal operations without any specific maintenance or recalibration, ensuring almost no downtime or collision-related costs. Users’ productivity, flexibility and autonomy are further accelerated by the Mikron MILL P 500 U’s rConnect readiness. Manufacturers simply choose the GF Machining Solutions digital services that best fit their needs. LRA, for example, delivers highly secure, direct, customer-authorized real-time remote assistance by connecting the customer with the local diagnostics center and GF Machining Solutions’ Technical Units. With LRA, Customer Services can inspect a machine tool remotely, with diagnostics carried out by the customer’s own technician or a GF Machining Solutions expert. Precision parts manufacturers and mold makers today require solutions ensuring precision, process reliability and high productivity. At the same time, they need the means to keep pace in a continuously changing environment. Therefore, agility is a key success factor. The Mikron MILL P 500 U was developed to meet these very needs. It serves manufacturers willing to invest in assets delivering an agile competitive advantage. See for yourself at IMTS 2018 in GF Machining Solutions’ booth 338754 (South Hall). GF Machining Solutions is the world’s leading provider of machines, diverse technical solutions and services not only to the tool and mold making industry but also to manufacturers of precision components. The portfolio ranges from electrical discharge machines, high-speed and high-performance Milling machines - including clamping and palletization systems, 3D Laser surface texturing machines and Spindles to solutions for Tooling and Automation, services, spare parts, expendable parts, consumables and Digitalization solutions. GF Machining Solutions is a globally acting Division of the Georg Fischer Group (Switzerland) and maintains a presence on 50 sites worldwide within its own organization. Its 3,255 employees generated sales of CHF 992 million in 2017. More information can be found at www.gfms.com.